At the present time the Dharma Fellowship has two active branch centers: one a major and very busy center in New York City named Dampa Sangye Dharma Center, and the second, a quiet Hermitage meditation retreat-center on 60 acres of peaceful land covered in rolling fields and dense forest, located on Denman Island, on the west coast of the Dominion of Canada. 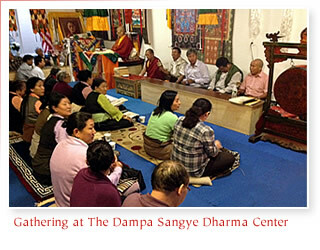 The Dampa Sangye Dharma Center (DSDC) is a community service based Buddhist religious and educational organization that provides a place for spiritual teaching and practice to be carried out for a large number of people in New York City. The Center is run on democratic lines by an elected Board of Directors. 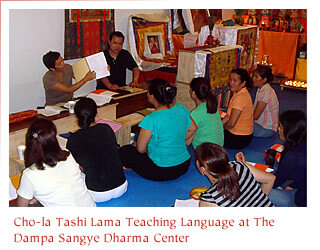 Since New York is home to over 8,000 Tibetan and Himalayan people from different ethnic groups, the Center is well attended by a mix of people of Tibetan, Sherpa, Dolpo and Nepalese ethnic background, as well as by numbers of Caucasians and others, all interested in studying and practising Buddhist principles and meditation. The Center is also a place where children are being instructed in traditional Tibetan cultural values, including the reading and writing of the Tibetan language, the study of classical Tibetan philosophical texts, and Buddhist religious ceremony. We are supporting a series of free classes on ‘English as a Second Language,’ very beneficial to all who attend, especially arranged for the elderly. The center likewise holds sacred ceremonies and festivals following the Ka’gyu Buddhist religious calendar. The DSDC is under the spiritual leadership and explicit direction of the Venerable Bardok Chusang Rinpoche, a greatly respected High Lama of the Ka’gyu tradition and a leading elder in the Buddhist community as a whole. Rinpoche is recognized as the authentic incarnation or ‘Tulku’ of the eleventh century Indian yogi-saint, Pa Dampa Sangye, who was a great Mahamudra master. Rinpoche was a disciple of the famous Yogi Tipun and in consequence during his younger days he spent more than six years in isolated retreat, practicing meditation on the north side of Mount Everest, before coming to Nepal, and then later to America. Venerable Bardok Chusang Rinpoche is one of the last great elders of the old Himalayan Buddhist community that escaped from war torn Tibet in the late 1950s. His phenomenal presence and deep spirituality has earned the profound admiration of both His Holiness the Dalai Lama and the Gyalwa Karmapa. Bardok Chusang Rinpoche has long been an elder friend of Karma Kunzang Palden Rinpoche, venerable Head Lama of the Dharma Fellowship of His Holiness the Gyalwa Karmapa. Both have an enduring love for each other. The elected President of the DSDC board of directors is Anthony Giovaniello. Anthony is a trained acupuncturist and medical practitioner by profession, a long time student of Asian medical techniques. Besides acting as president, he is in charge of organizing traditional therapeutic facilities at the center. A major aim at the Center is to make available as detailed an understanding as possible, and a knowledgeable appreciation for the practical application of the many valuable traditional therapeutic techniques that have been known to Chinese, Tibetan and Indian ayurvedic therapists for thousands of years. 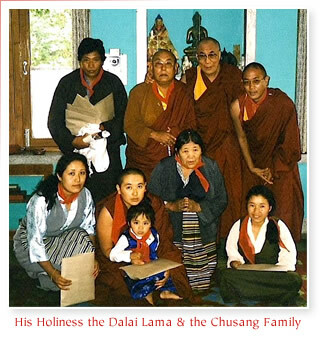 Dr. Sonam Rinchen, a trained Tibetan medical doctor, is actively connected to the Dampa Sangye Dharma Center. 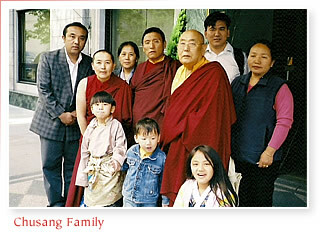 Dr. Sonam Rinchen is a graduate from the Dharmasala College of Tibetan Medicine. For many years he and his wife operated a highly successful clinic in Pokkhara, northern Nepal. They will be assisting at the Center in various capacities. Another important figure playing a leading role at the DSDC is the venerable Buddhist nun, Chö-la Tashi Lama. Her many duties include that of director of Youth Education, which particularly focuses on the development of Sherpa and Tibetan children who live in New York City and dearly need living contact with their cultural roots. The venerable Cho-la previously has spent many years helping young orphans and young refugee monks in Nepal. She was for a long time our liaison there with the local refugee community. Although we are still interested in helping children in Nepal, the venerable Cho-la’s work now focuses on the education of children from Himalayan backgrounds in New York City. The DSDC is located at 40-23 76th Street, Elmhurst, NY 11373. Here we have a large two thousand square foot space where activities, religious ceremonies, teachings and meditation, are regularly conducted. The space is also open for use by other Buddhist religious groups in the area who have a need of space in which to pray, practice meditation, rehearse ceremonial performances etc., or in other ways conduct their religious activity. The Center’s location is in the heart of a vibrant community with good access to all major subway lines. All are most welcome to attend. For more information, please visit www.dampasangye.org.